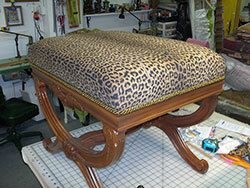 Debra Fabian is an upholsterer who helps turn chairs from worn, faded and lumpy to refreshed, stylish and comfortable. A small business owner, Debra started her upholstery business in 2002 to combine her love of furniture and woodworking and to help others realize that sometimes it is better to keep a well-loved chair and have it brought back to life with new fabric and stuffing. 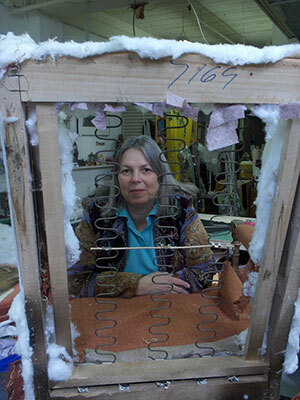 Prior to starting her business, Debra earned an MFA in sculpture specializing in woodworking. She spent years selling high end furniture and later managing a sculpture studio in Milwaukee , but longed to return to woodworking. 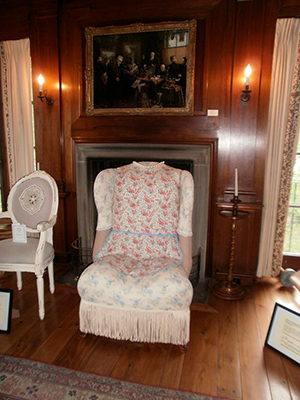 After 3 years of studying upholstery with a Master Upholsterer from Porter's of Racine , Debra started her own business, “Just Chairs”. Today Debra's business offers a wide range of services all related to chairs– from re-upholstery, refinishing and faux finishes, funky cushions and pillows in all shapes and sizes. I hope you are having a wonderful vacation! Thank you so much for delivering the chair last Saturday. It turned out beautiful, and was put to good use on Sunday when our family was here, as all of the adult kids were gathered in the new seating area. It warmed my heart, as the intention was to draw people into actually using the space better. I was so excited about getting the chair back that I forgot all about the extra fabric. I am hoping that there was some left over, and wondering if I can set up a time to pick it up, once you are back from your trip. Let me know what will work for you.